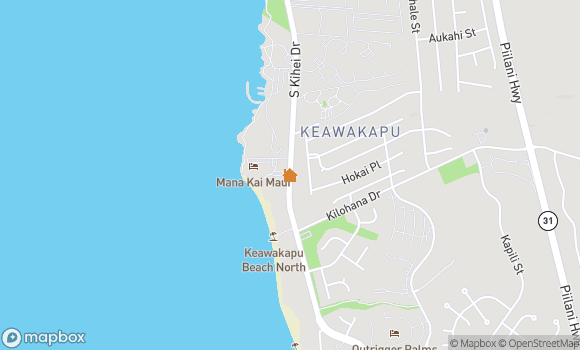 Mana Kai 411 Spectacular 2 BR, 2 BA Ocean Front Property! Location, location, beautiful beach. Great sunset. Too much construction....water turned off several times during our stay. Very noisy due to construction." Our rental unit was just what we needed—beside the ocean!!! The place was clean and tidy and we were happy with it. The little things could make a big difference...small extras that let you know you are worth it...flowers, enough toilet paper and soap for your stay...but these are just little things. We loved it...thanks so much!" Beautiful view of the ocean and down the beach from our lanai. Great sunsets from the lawn. Everything except the screen door on the sliding glass door was perfect. (this should have been caught by the cleaning crew prior to our visit) Great Location. " We stayed in this unit in 2010 and loved it. This time not so much. We were pleased with everything with the following exceptions. The lanai was filthy upon our arrival. We had to clean off all the furniture and the railing before we could use it and the was a broken chair. The shower head was defective and the management staff reacted very quickly to replace it and provide us with a bath mat. We had to change a few light bulbs which we should not have had to do on arrival. The unit was clean but there the is a serious problem with the curtains in the unit. The hem was ripped out on the left side and it looked like they had not been cleaned in a long,long time." We had a wonderful vacation at the Mana Kai. The beach is the best in Hawaii, the pool, and grounds are amazing, the view is spectacular any time of the day and in almost any weather. Our host, gave us lots of good suggestions on places to eat in Kihei. We tried many of them and enjoyed them all. This ad has been viewed 539 times.